Oh yeah, now we’re talkin’. 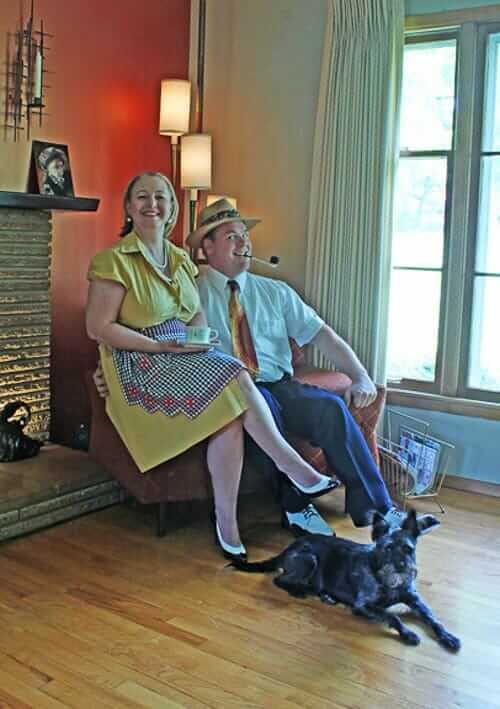 Get yer cameras out, readers, and keep sending me photos like these — as Jim and Kathleen Owens, dub it, “Family Portrait-Ala-Cheese!” including dog pal Indy. And yes: There’s a beautiful house and inspiring story, too. Things couldn’t have turned out better! 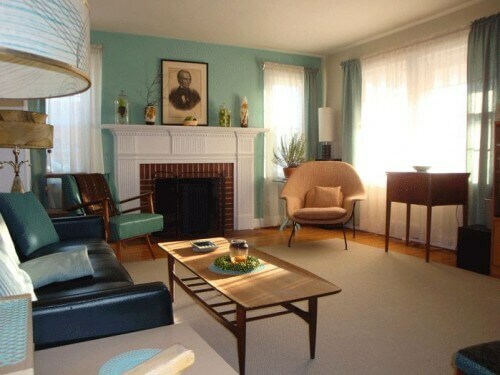 Last fall we bought a nice midcentury modest. Our little slice of 1960. The house was still very original but needed some love. When we viewed the house there was a list of “upgrades and improvements” they were going to do including painting the paneling in the basement. WHAT!!! Stop! Dont “improve” anything. Once we moved in the projects started. Being avid antique and thrift store hunters, we have furnished our living room for what most people would pay for a new chair. We’re pretty handy so we have done all the improvements ourselves. I’m the artist in the family, but my wife has been the best at picking colors for the house. Originally we painted the entire room the gray green color, but the room felt dull. It needed something. 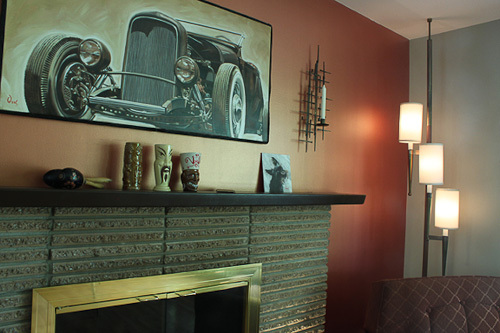 Kathleen had her eye on those metallic colors and suggested it for the fireplace wall. Great idea! So we painted it. This was when we really noticed how bad the putty on the paneling was. Being a bit of a perfectionist, I couldn’t stand it. So I ripped down the paneling and put up new drywall. A fresh coat of copper paint and it looks great. The copper was a two-step process. First a base coat then the metallic coat. A bit of work but worth it. We tried metallic silver in the bathroom, but it ended up looking like a spray painted cardboard box. The metallics can be tricky. But somehow they add a bit of retro funky while still being a bit elegant. We fell in love with the big front window. That is our little guy “Indy” on the chair in the background. Yes, we named the dog Indiana. We are mad about our lamps with the metal blind shades. They don’t make em like that anymore. Our tables were made right here in Tennessee in Johnson City. We bought a set of four tables, two end tables, the coffee table and a groovy two tier corner table.They even have a date and an inspector’s name. 5-8-56 Gordon’s Furniture Inspected by Jim. The couch and chair were bought as a set also. I think it gives a room cohesion if you have a few main items in a a set. While cleaning the tub the first time, the tile in our pink bathroom shower collapsed due to the grout needing to be sealed for about 30 years. 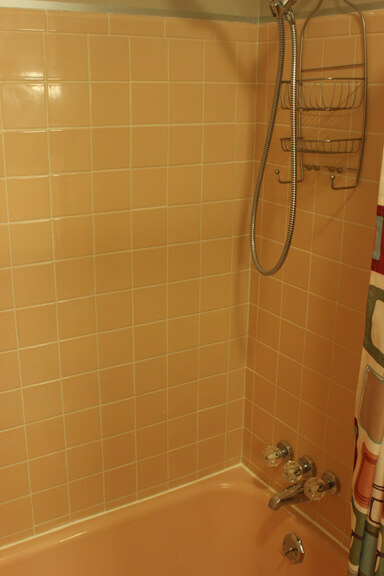 Carefully I removed about ninety 4×4 tiles off the shower wall. 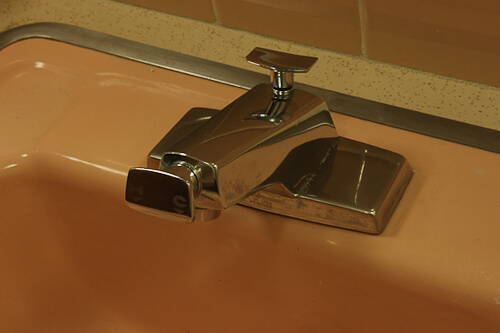 Two were white where they had replaced a soap dish. Another broke while being removed. So I need three peach-pink tiles that hadn’t been made in about 50 years. Hey what’s this? 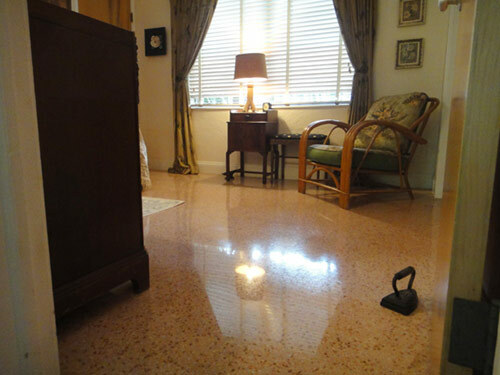 Here’s an article on Retro Renovation about a honey hole of tile called World of Tile in Jersey. A couple phone calls and mailing a broken piece to Chippy and I hit the jackpot. Matched my tile. The hard part was cleaning the drywall and glue from the back of the tiles, which I did with a scraper and wire brush. Yes the paint is “Greige”, but it worked wonderfully with the peach-pink that was very hard to find a color to go with. [Pam clarifies: I am not opposed to greige or to gray or beige — it’s just Greige on Every Surface of the house that depresses me. Pink and gray bathrooms are loveliness incarnate.] So let’s talk toilet seats. 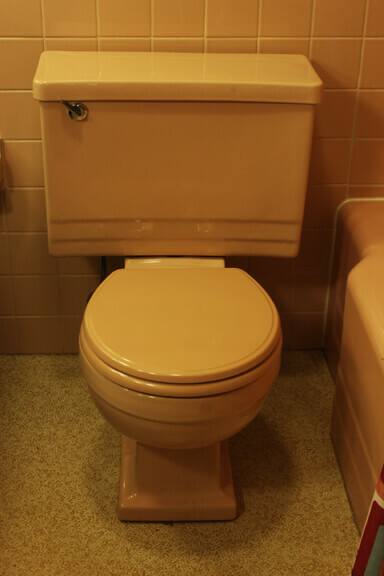 Where does one find a peach-pink toilet seat? You don’t! So plan B, you make one. We bought a nice white seat and took a piece of broken tile to the hardware store to figure the color formula. For some reason, they couldn’t mix the paint for me, so I bought a plastic bucket with a lid and had them pump the pigment into it. I then bought some Rustoleum white and mixed it myself. I bought one of those spray kits that come with an aerosol can and glass jar on the bottom to spray the paint. I thinned the paint first, disassembled the toilet seat, and a few coats later the throne had a matching seat. Oh did I mention the original linoleum floor?! 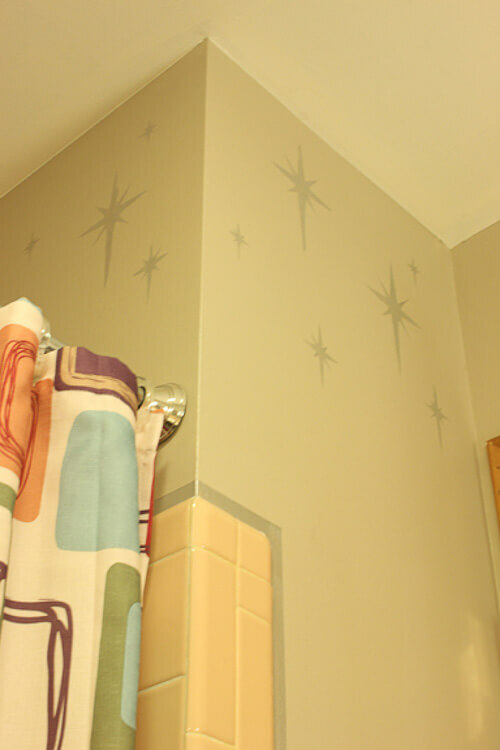 The (stenciled) stars are silver and look different depending on where you stand in the light. I believe I also found the star pattern on your site. 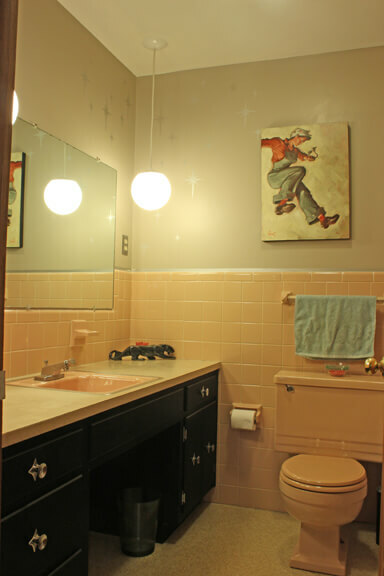 We used a Rustoleum cabinet kit on the vanity. That stuff is amazing! Knobs with star backs from Rejuvenation. I found our cool “Jestons” type faucet at the local ReStore. You pull the lever out of the front and turn it right or left for hot and cold. It was dirty and attached to a nasty old sink. A few bucks for a rebuild kit from the plumbing supply and we have a stylish faucet for under twenty bucks. I wanted to share this bar with you. All my life my uncle owned a company that made barstools, booths and bars for restaurants. 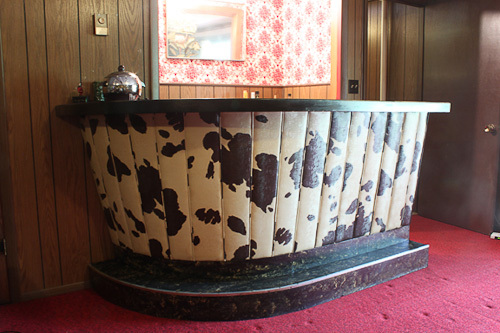 In 1957 he made this bar for his own house. I have fond memories of holidays in his basement with this bar. 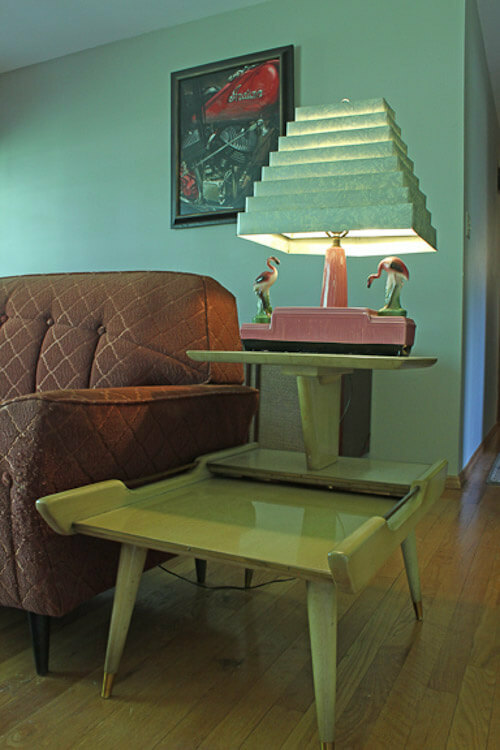 As kids we used to spin on the atomic, cone shaped stools that matched. Unfortunately they are long gone. In the late 70s, my cousin put the bar in his basement and covered the pony hair with brown vinyl. A few weeks ago we went up to Michigan, where we are from originally, and brought the bar home with us to Tennessee. We pulled the brown vinyl off and the pony hair Naugahyde underneath was perfect. A quick clean up and it looks like new. 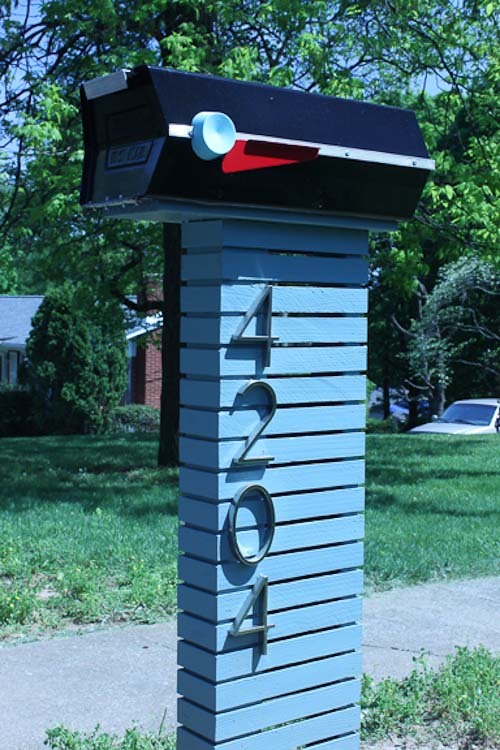 Here is our Atomic Mailbox. 1950’s Sear Roebuck Co.! It has a solid fuel booster and was part of the original Mercury program. 3-2-1 lift off! … A few months ago our mailbox got run over. So I started looking for a new stylish mailbox. Oh you can find stylish mailboxes but you are gonna pay an arm and a leg for them. And of course I can’t be satisfied with a run of the mill mailbox. (It’s like a sickness.) So I hunted down a cool 1950s era mailbox. It needed some love so I spent a couple weeks cleaning it up and painting it. I built the post and we found the numbers at the local big box store. Thanks for doing your blog. It has been a great help and inspiration. 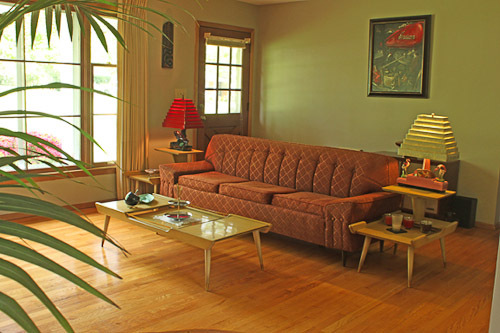 As far as what drew us to the 1960s house, we were specifically looking for a postwar house built between 1945 and 1965. We physically toured at least 50 houses on our hunt. You can see the quality drop after the mid-1960s. So part of our choice was practical. 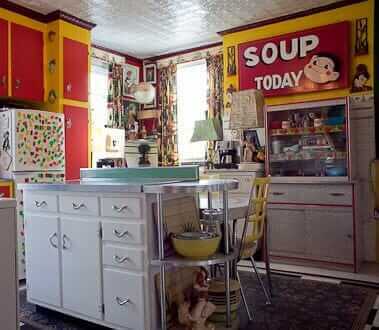 We wanted a house with history. Kennedy was president when our house was built. 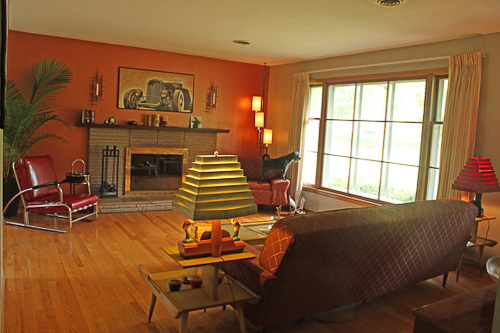 We fell in love with the midcentury details in this house like the massive front window and the fireplace in the living room. I have always had an affinity for the styles of the middle of the 20th century. From Art Deco to Streamline Modern (Yes they are two different styles.) From Danish and Atomic to Mod, these were specific styles that numerous artists were exploring that made for a visually interesting and cohesive design. It seems we don’t have that much anymore. Or maybe we have it but it’s harder to see while living it. I think I read on your site that people think nothing of restoring a Victorian or a Craftsman style house and furnishing it with period proper items. We just want to do it with a mid cen place. Long story short, aside from quality of build we wanted a place that felt right with the styles that we want to enjoy in our home. 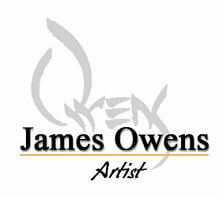 I will keep you posted from time to time as we tackle other projects. Like the yard, the other bathroom, the basement, don’t even get me started on the kitchen!! P.S. You can see we are hams but I actually do a bit of acting. I have a guest star role on an upcoming episode of “Tyler Perry’s House of Payne”. And I have a co-star role on the second show of the upcoming season of “Drop Dead Diva”. I play officer Andrews. I think the new season starts in June. Keep and eye peeled for me. 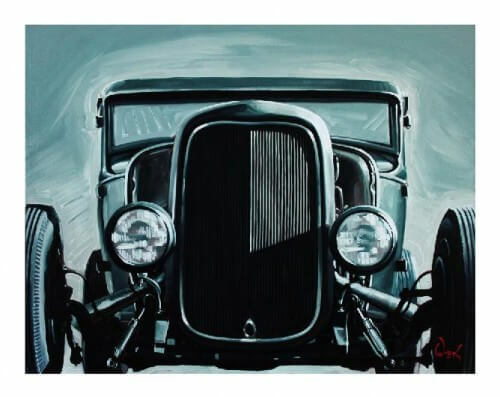 Readers, Jim’s artwork is full of vintage cars, dames, PIs and more — see it at James Owens Studio aka Car-Noir.com. What an amazing home. 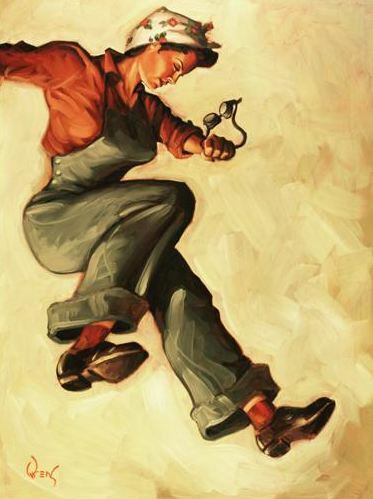 I love the style and the art… and it is also a very cool article. Congrats to you Jim and Kathleen for getting out of the CA rat race (and oh-so-high cost of living). Someday, I will escape this state too! I love your house, and the art is great! And that frieze upholstery, oh my. That has to be one of my TOP items that I really wish would be reproduced. I guess the manufacturers all figured out that upholstery that is durable enough to outlast us was not in their best interests. Thank you for sharing your home, can’t wait to see the rest of it! Thank you all for the nice comments. And thank you to Pam for the wonderful blog. It has been very educational, inspiring and helpful. Not to mention addicting. The blog needs to be a TV show! Pam, Knoxville is the home of H.G.T.V. Wonderful house, amazing art! You are both truly talented! I agree Pam should be on TV but you do realize there’d be far fewer bargains to be had. Doubled edged sword that. What a beautiful, beautiful home. Love your art, too! You both did such a great job capturing the beauty of every little thing in the house. 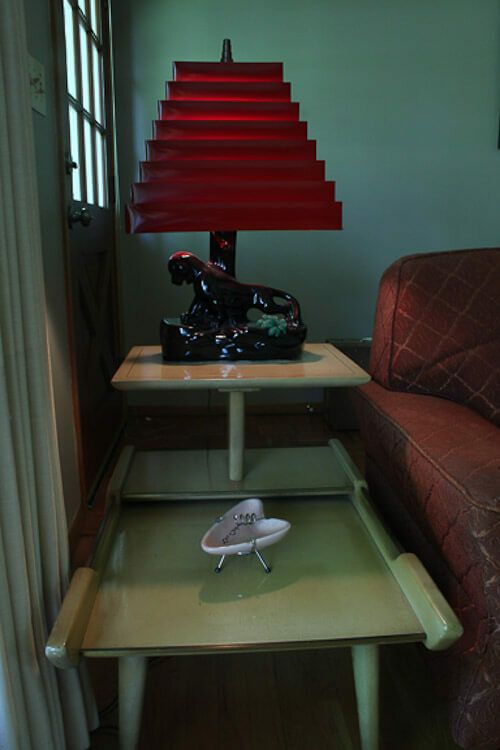 LOVE those lamps and the side table (and the doggie looking out the window). Wow! Such a cool place! I love it all! I am amazed at your dedication…painting your own toilet seat! That’s love! Glad you snapped this place up before they “improved” it!